Patience is a virtue, or so you’ve heard. 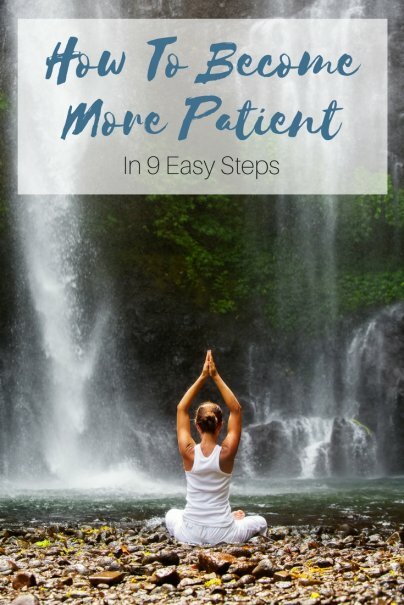 But if you’re like me, you wonder how patience could benefit you, not just the people who seem to relentlessly and persistently demand patience while seemingly causing unnecessary delays in a fast-moving world. Eventually, though, you’ll discover that impatience can thwart your otherwise deserving efforts, interfere with reaching your goals, and cause trouble. When exercised at the right times and in the right ways, patience can not only augment forward movement but also build respect for you and your decisions. The best way to cultivate patience is to practice patience. That is, pretend to have patience, and see what happens. The more you test acting patient in various scenarios, the better you become at discerning when patience is necessary for desired outcomes or when aggressive action is the right way to get things done, when being patient commands esteem or when agility wins favor, when being patient helps you to gain support or when quick decisiveness gets you noticed. Don't mistake patience with tolerance for inaction. True patience is working while you wait. This process should involve regular evaluation of whether the tasks you are doing or waiting for someone else to complete are going to deliver the results you want. Setbacks are frustrating and can lead you to lose patience, not acquire it. Very often, though, mistakes you make, rejections you receive, confusion that arises, and support you don't win gives you insights that help move you closer to whatever outcome you desire. Setbacks, then, are not simply delays. They are signposts that can guide you to your destination. When things don’t happen or unfold as planned, consider what happened. Figure out if you misread a situation, overestimated the strength of a supporter, needed more information, etc. Revise your approach and keep moving. To become patient, you should have a general idea of how long things should take. For example, there are commonly accepted timeframes from request to response for many situations, such as a marriage proposal (immediate), thank-you letter for a new job (1-3 days), or a prototype request (a week or longer). Your expectations should have some basis in reality. Ask friends and experts to figure out what is considered reasonable for a waiting period. Figure out whether you are willing to wait for whatever time is required. If "yes," wait patiently with the understanding that the timeline may be longer than you had anticipated. Re-evaluate your decision to be patient if things are not moving along at a reasonable pace. If you are not willing to wait but want to try a plan B, remember that you may still not get what you want when you want it. Plus, you may find that quality standards may be lower and prices could be higher if you choose the fastest possible method, with notable exceptions like instant downloads and express delivery. Or you may abandon a particular goal or desire altogether if the wait is too long. There is no shame in not being patient and waiting for something that you later realize you don't really want. When confronted with a new challenge, an unfamiliar scenario, or an unclear assignment, take your time to devise a well-conceived plan. Such planning typically involves researching an opportunity, learning what others have done in similar situations, and determining what’s novel about your challenge. It also requires investing significant amounts of time to absorb information, process new ideas, and, finally, connect the dots to craft a breakthrough solution. Remember that rushing doesn’t help. Impulsiveness causes you to move along too quickly, later making you hesitate at critical points that require swift action and making you uncertain when decisiveness is needed. Be patient with yourself as you learn, absorb, adapt, strategize, plan, and execute. Notice how moving too fast can compromise success of an endeavor. While many people (claim to) work well under pressure, most need sufficient time to get things done right. That often means that you must patiently wait for your turn or allot plenty of time for whatever you are trying to accomplish. Research home prices or review home inspection reports before snapping up a new property listing that you later learn is overpriced. Compare benefit packages and corporate cultures associated with two different job offers before accepting one that isn’t a good fit with your work style and personal needs. Teach a new skill or technique to a friend, coworker, or child, taking shortcuts that lead to mistakes and long-term learning problems. Get to know someone before taking significant steps toward a long-term relationship, preventing you from laying a foundation of mutual trust. Become aware of the right moment to bring up a sensitive issue with a friend or coworker. By refraining from an aggressive confrontation and waiting until the person comes to you for advice or the topic emerges as a concern, you may be able to more fully capture this person’s attention and maintain a friendly relationship. When the time is right, weave your talking point into a conversation. Perhaps your friend is confounded by his child or a coworker is frustrated with her boss. Get both attention and appreciation as you problem-solve, rather than challenging them before they are ready to listen. Learn to enjoy your present state, the time before your goals are realized and when there is still uncertainty about whether your efforts will reap benefits. Be grateful for what you have right now, show pride in your accomplishments to date, revel in whatever you are learning and doing, and plan for rather than fret about the future. When you demonstrate patience, onlookers — including your friends, family members, bosses, coworkers, and customers — may think that you are not aggressive enough. They may wonder why you don’t take immediate action, even as they complain about those who act too rashly, make quick decisions without considering all aspects of situation, etc. At the same time, some people will consider you impatient simply because you insist on moving forward. But after you have cultivated this virtue, remember that you are the best judge of whether you are showing enough or too much patience. Just recently, I discovered that having the aura of patience can help speed things along. That is, a polite smile despite delays, willingness to wait, etc. encourages people to provide immediate help rather than sending you away to come back another day. The best thing about having patience, though, is being able to discern when to wait and when to act. "Don't mistake patience with tolerance for inaction. True patience is working while you wait." I love this. There have been too many times when I've discovered that people I have been waiting for are finally ready to do something...but I'm not, because I haven't been working while waiting. Thanks Meg. Someone else taught me that and then the whole idea of patience made a lot more sense to me. I used to be really, really patient when I was younger. There was a time when even when someone would cut me in line, I wouldn't mind. But I've noticed that as I got older, my patience seems to be wearing out. I mean, I can still be patient.. there'd be times that I'd still let someone cut me in line, and I'd be seething in anger quietly. But unlike when I was younger, there are now occasions when I'd let other people know that, Hey, I was here first. Go back there and wait for your turn.. Thanks for your comment. When I was reading what other people on the web described as "patience," I noticed that what many of them referred to was what I would consider "anger management," which is a form of patience. My definition was more along the lines of having perseverance and not bugging people to hurry up for my convenience only. So, I wouldn't consider calling out someone else for breaking in line being impatient; I would consider complaining about the long line and the wait as being impatient though. I think that is why people liked those bakery lines where you pulled a number and waited until your number was called rather than jockeying for position. And, now that I think of it, it helps if the folks serving move things along! I was at an end-of-the-year banquet last week and it took an hour to serve about 150-200 people, and I was one of the last groups to be called. That called for extreme patience, esp. when the time announced was half-hour earlier than the actual dinner start time. I will be on the board of this group next year, and things should go faster -- just stage the salads (they're all the same so you don't have to customize anything) and prep the drinks (people can pick them up, rather than tell you their preferences and wait for you to pour) etc. to move things along. So, there are times when being too patient isn't in the best interest of everyone and times when it is extremely helpful.